The Porch in Soulard is the most unique shopping destination in St. Louis, offering a wide and eclectic range of gifts and home furnishings and a full selection of wines from around the world. 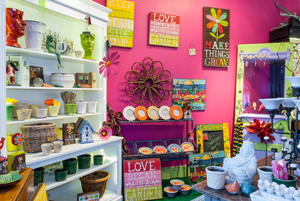 The Porch is a true shopping experience for one-of-a-kind and hard-to-find ideas for your decorating and gift giving needs. We are always updating our selection of gifts and furnishings to ensure that there is always something new for you to explore and discover. Feel free to sip and shop while you browse through our ever-changing selection. 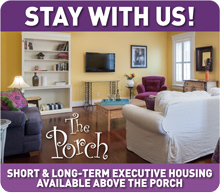 You might come to The Porch for the relaxed and unique shopping experience, but you'll want to stay for our our special events! We fill our patio with intimate seasonal events from Spring through Fall as The Porch becomes a popular hangout for neighbors and friends ... both new and old. Throughout the year we host free Saturday wine tastings, Mardi Gras, Oktoberfest and many other special events. We celebrate the diversity and true spirit of the Soulard community and invite you to come experience the Soulard style and so much more at The Porch.